The company that provides endless organization options brings you the 449 Series. 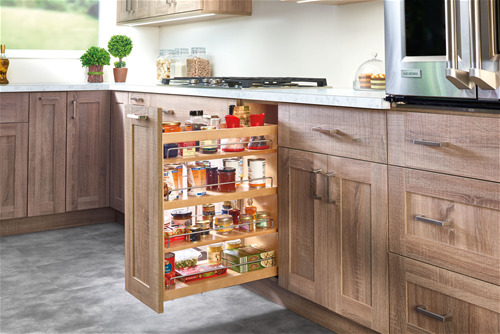 Designed for 9” and 12” base cabinets, these three shelf units are TSCA Title VI compliant and feature natural maple construction, BLUMOTION bottom and side mount soft-close slides that maximize stability and patented door mount brackets with micro-adjustments (US Patent No. 8,388,076). The face frame units feature a foldable slide set for easy installation and fit 1-3/4”, 1-1/2” and 1-5/8” frames while the full access units fit ¾” and 5/8” side walls. 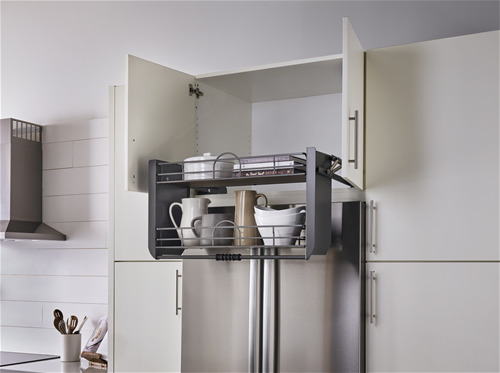 The 5PD Pulldown Shelf conveniently brings hard-to-reach items down 11-1/2" while pulling out 16-3/4" from the cabinet. This orion gray, two-tier pullout features a unique gas assisted lifting/lowering mechanism that provides unparalleled stability through the entire range of motion and the arms lock into the down position for complete accessibility. The 5PD features a flat wire construction and includes both side and bottom mount brackets with walnut solid bottom baskets for easy installation. Available for 24" and 36" wall cabinets.